We may have never met but I already know we have a lot in common. We both love the ‘beautiful game’ of soccer. Call it what you will – soccer, football, footy – soccer is an amazing game which not only demands a lot of skills of you but teaches you a lot too. If you approach it right. Like with any sport, a huge part of succeeding at soccer is in your mental attitude and that is where Soccer Motivators comes in. My objective is to help you mentally prepare to be the best that you can be in your soccer performance. I promise you that you don’t have to be a sporting hunk or a mega-muscled he-man to do well at soccer and to get a lot of pleasure from playing the game. My Soccer Motivators e-book provides ways for you to adopt a winning attitude and prepare you mentally to be a winner. That mental attitude is what sets top flight sportsmen apart from rank amateurs and those that like to have a kickabout in the park on Sunday. And even if a Sunday morning kickabout is bliss – it’s nice to win sometimes, isn’t it? Get your head right and you can get your soccer right. Soccer Motivators can help you. Are You Ever Plagued With These Doubts? Why do I seem to miss every penalty I take? Which tackles should I go for and which should I back off from? Am I playing the right position? Am I an effective soccer team player? Would I pick me if I was manager? Why can’t my team make it up the league? Playing soccer well and consistently isn’t easy. A lot of things have to come together to make this work so you can be the soccer player that you want to be. My Soccer Motivators e-book gives you a fun and informative insight into the psyche of a successful football player. Whatever level of soccer you aspire to, these cartoons and inspirational quotations will give you food for thought and point you in the right direction so that you can get yourself into a wining frame of mind and work effectively with your team-mates on the soccer pitch. I guess by now you are wondering who on earth I am to be offering you advice on your soccer playing. How can you trust me to improve your mental approach to the game? divisions and I played in 12, 11, 10, 9 as we got promoted each year. One wise-cracking team mate described me as ‘unfit, can’t pass, shoot, head, chest or control the ball – but WHAT A THROW!’ So most of the time I ran around taking throw-ins from all over the park, I played to my strengths! When I played to my strengths and got my head around the fact that maybe I could do this, I started putting in some serious practice. That’s how I got better at football and that’s how I helped my team rise up the leagues. I can help you think about the game of soccer and the way you play it in a whole new way. I can inspire you and kick start your positive thinking so that you approach practices and matches with a totally different attitude. A winner’s attitude. Being fit and a talented soccer player isn’t enough; you’ve got to believe you’re good enough - ‘it’s all in the head’ as they say and that’s where the Soccer Motivators come in - The ‘I can do it’ positive attitude of the cartoon characters ‘Wina’, ‘Mog Tivata’ and the ‘Positive Posse’ calls upon strategies that effective cognitive behavioural therapy and neurolinguistic programming have called upon for years with great success. If you want to behave differently, you need to think differently. The funny and gently encouraging cartoon characters will motivate and inspire youngsters and oldies alike to keep going when the going gets tough. They will inspire and motivate you to carry on regardless of whether you’re feeling down, with funny, encouraging soccer cartoons, football one liners, soccer quotes and affirmations. It will teach you to look at the sport in a way you could never have worked out on your own. I’ll help you adopt a winning mental approach to your soccer. I’ll give you the psychological tools you need to sort out your attitude toward soccer. I’ll give you a strategy to be mentally as well prepared for any game that you can be. Oh, and I hope I’ll give you a few good laughs along the way, too! In just a few words (and many pictures) Soccer Motivators teaches you a lot about the theory behind winning and losing, and it helps you make up your mind to me on the winning side and to do all you can to commit to making that happen. Self-doubt is banished with the laughter and gentle thought-provoking that you will experience as you flip through the pages of Soccer Motivators. Get the 105 page Soccer Motivators e-book now for only $17. Get your hands on 100s of inspiring quotes on football and 70 motivational soccer cartoons that you can use as part of your training or that of your team. Pin them up, live with them, and let the inspiration of some soccer stars and some of the world’s greatest thinkers transform your sports brain. Let them help you become a winner. What will the Soccer Motivators e-book do for you? It will show you how winners are made, not born. It will show you what sets winners apart by the way that they think. It will help you prepare yourself mentally for any soccer match. It will demonstrate the mindset you need to be a better soccer player. Just $17 is all you need to turn yourself into a winner with Soccer Motivators. ORDER YOUR COPY OF SOCCER MOTIVATORS BELOW! And see how easily you can turn around your thinking and rise up the soccer ranks – without even feeling like you’re doing anything but having a laugh at some great cartoons and reading a few insightful quotations. I know you will benefit from a fresh, positive outlook on the game of soccer and all its trials and tribulations. I am sure you will get yourself in a better frame of mind to tackle (pardon the pun) your soccer playing and I am positive that you and your team mates will reap the rewards if adopting a winner’s approach to soccer. You get ALL this for just $17. Now, obviously, I can’t hold down this great low price for ever. You need to act now to be sure of getting your hands on my Soccer Motivators e-book for $17. My accountant isn’t happy about me charging so little for such a great product which he knows works, so I will have to give in to him and raise the price sometime. But, as I see it, I’m saving money marketing this product online, so it’s only fair to pass those savings on to you. 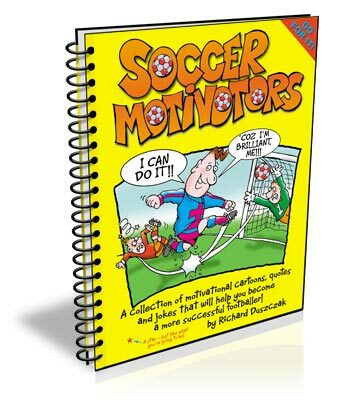 Created by Richard Duszczak, founder of Cartoon Motivators cartoon studios, Soccer Motivators arms soccer players, parents, coaches and anyone else who wants to improve their game with the right stuff to create that “I can do it” positive attitude.